The reference for Scottish gardeners who wish to choose the best plants, hopefully for generations to come. 'WHEN ALL the gardening world is focused on plants for drought, it's good to find a book for those who garden in the cold and wetter parts of the north. Garden Plants for Scotland (Frances Lincoln £25) hits the spot nicely. Kenneth Cox and Raoul Curtis-Machin know that climate well enough (Cox is part of the Glendoick Cox family of nurserymen, who have been collecting and growing rhododendrons for three generations) and so if a plant figures here, even a variety of rose, then you can be pretty sure it's going to do well north of the border and in the soggy, blasted Pennines. So keen are they on reliability that they have set up their own national bone-hardiness rating in defiance of the Royal Horticultural Society's southern take on hardiness, and also their own Scottish Garden Award, similar to the RHS's Award of Garden Merit, for their best 500 plants, chosen after consultation with experts throughout Scotland. There are lists of plants "resistant" to deer and rabbits too - there's brave! 'Garden Plants for Scotland by Kenneth Cox and Raoul Curtis-Machin (Frances Lincoln) is a new resource book for gardeners in exposed areas and is packed with advice on plants for Scottish conditions. The chapter on hedges, screens and shelterbelts is particularly helpful, giving details of spacing, growth rate and eventual height of many wind-resistant hedging plants. There is also a section on fruit and vegetables that suggests varieties of pears, blueberries and raspberries, that grow well north of the border. A must-have for keen gardeners from The Borders in the south to Shetland in the north. 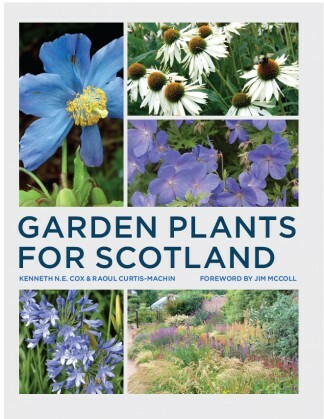 A highly readable guide... Garden Plants for Scotland could be the potting shed companion you are looking for. Imagine if you were to head off on a tour of Scotland, stopping to chat with the country's garden experts at every town along the way.You could find out which trees stand up to the wind in Shetland, which climbers will survive on a north facing wall and even which plants are widely offered for sale in Scotland but should be left on the shelf. Sadly most of us don't have the time, resources or contacts to take such a trip, but the good news is that two men have done it for us. An essential companion for any Scottish gardener, both experienced and beginner. While not a specialist book I can highly recommend it for any gardener in Scotland or one in a similar climate and it would be an extremely useful book to give to any one just starting out on the gardening journey. T: 01463 243250 or T: 01463 223607. Coldingham, Eyemouth, Berwickshire TD14 5TZ.